Meet top international Master’s programmes in New Delhi on February 13th will be held at Windsor Place. 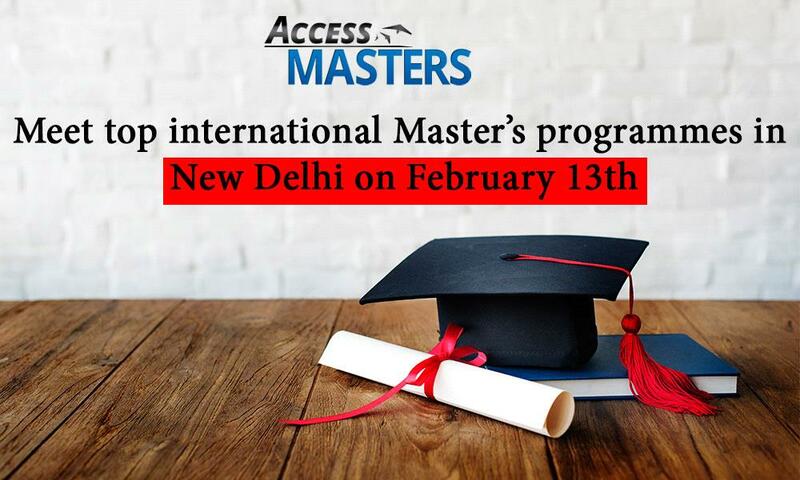 The Access Masters event in New Delhi gives you the opportunity to find the graduate programme that fits your personal and professionals goals. Why consider a Master’s degree? Masters graduates around the world benefit from excellent career prospects and personal growth thanks to their international education abroad or in their home country. A successfully completed Master’s degree can guarantee a higher starting position, better starting salary, and faster career progression. What can you expect from the event? • Open fair with the world’s best universities and business schools • One-to-One meetings with school representatives • Personalised advising, TOEFL/IELTS/GRE/GMAT prep and scholarships + Win a trip to the school of your choice! The event is free of charge and open to all registered attendees, but early registration is mandatory to be selected for One-to-One meetings.